When Colm Lyon, founder of Realex Payments came in to chat about his next venture, Fire Financial Services, we were naturally excited about working with him. When he told us he had acquired the domain name Fire.com we fully understood how ambitious a venture this was going to be. Fire is a new digital payments FinTech for both business and personal use with the ability to trade in both Euro and Sterling. We worked with Colm and his team on the initial strategy and messaging around Fire. We wanted to link the name to the proposition so the line Fire Changes Everything became the mantra as this technology is set to revolutionise how we bank. For the visual identity, we didn’t want to resort to obvious clichés and so the colour palettes for both business and personal accounts come from ultraviolet and white when fire is at it’s hottest. The logo is a carefully crafted word marque which, in a lot of it’s application, appears white, above a series of moving lines which mimic the flicker of flames and create a dynamic to the overall brand. 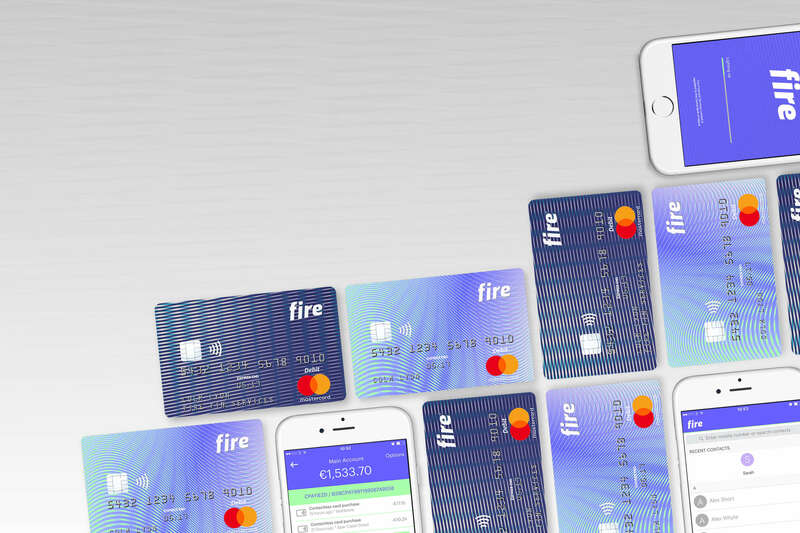 The project works involved the design of both personal and business account Fire debit cards, all promotional material and working with the IT team at Fire on the design and UX of the website and apps.